We have all seen it, a happy dog standing with his front legs on the side of the bed of a moving truck. Sure, he has the cool breeze running over his face, and the “freedom” to look around and enjoy the outside air, but just how dangerous can this ride be? A truck bed is an open box with four metal sides, a metal floor, and no lid that is made to haul strapped-down inanimate objects - not your best friend. Pets that are riding in the bed of pick-ups may seem to be enjoying themselves, noses in the air, running around the truck barking and wagging their tails; but imagine the first fast stop, pot hole, or worse yet, a car accident. All 592 of the ejected dogs could have avoided these injuries had their guardians not placed them in the bed of the pickups. All of these terrible incidents can be avoided by simply not putting your four-legged friend in the bed of a pickup. When you have your best friend traveling with you, at the very least, keep him in the cab. Best case would be your dog in the cab wearing his seatbelt harness so he cannot move around thereby protecting him in the event of an accident. Any time an animal is traveling with you in a vehicle, make sure he is wearing a seatbelt that has been properly fitted to his body type. A dog jumping around in the car or truck is a hazard to your dog, yourself, your passengers, and everyone else on and around the road. If you simply “must” put your best friend in the bed of a pick-up, place him in a well fitted travel kennel that has been securely fastened down to the bed of the pick-up. Keep in mind, the elements will still be affecting him in the bed. Summer heat and winter cold can devastate your four legged friend and cause him great harm as well. 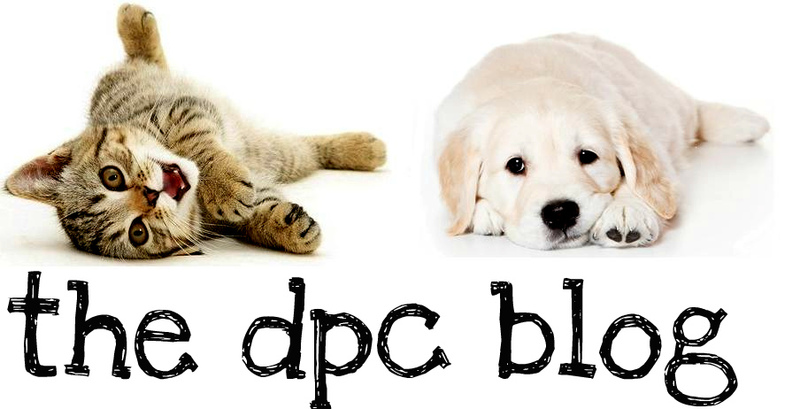 Keeping your best friend safe and at home with his loving family is the number one priority of DPC and your help is greatly appreciated. Many of our clients may recall that we had a pet staying with us in late 2010/early 2011 for several months. She had three legs and liked to spend time with us behind the front counter during our work days. Her name was Lyka, and this is her story. 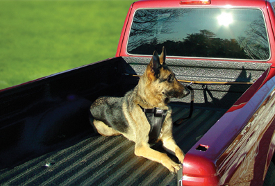 Lyka was presented to DPC in October of 2010 after riding in the flatbed of her owner's truck. She jumped from the moving vehicle, even though she had never done so before, and severely injured her leg. She came in for treatment that included wound care (she had "road rash") and radiographs, as she was limping noticably. It was discovered thereafter by Dr. Bawa that her femur was fractured. She underwent femoral fracture repair surgery and the owners were informed thereafter that in order to save her limb she would need strict cage rest. After a few weeks she was brought back in and it was evident that the owners had disregarded the post-operative care instructions and her leg was in bad shape. Her limp had worsened and she was in visible pain. New x-rays revealed that the bone had not set properly, the pin was protruding from it's former location, and she was suffering from an infection. She was then surrendered to us and DPC assumed responsibility for her and her care. Lyka eventually healed and went to a new, loving home. She was three-legged but happy. Lucky for her the ending was happy but prior to her adoption she dealt with quite a bit - Several surgeries, alot of pain and the loss of the family and home she knew and loved. It's such a sad series of events, as it was easily preventable.. Please, please make sure your pet rides carefully at all times! Here's a photo of our beloved Lyka before she left us..